Smile Pet & Grooming , grooming shop, pet boutique in Phuket, we groom all breeds of dogs and cats. We believe that bathing & grooming are essential to healthy pets. 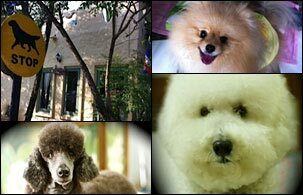 We offer modern style of dog grooming facilities with professional grooming stylists. Not only grooming service we also provide cleanness and comfortable environment accommodations for your lovely pet too. Smile Pet & Grooming ... Your pampered pet will go home looking and feeling great.